A soothing ambience often brings out our best creativity and cooking is certainly the most creative task we perform each and everyday. No wonder that kitchen designers are increasingly incorporating inspiring colors and designs to the otherwise neglected areas in today’s trendy kitchens. Kitchen tile designs are being created for walls and floors in the most colorful and striking kitchen tile patterns to not only catch attention but also provide the much needed cleanliness in areas like countertop, backsplash area etc. The ease of using tiles in kitchen, whether it is for floor or walls, is that you get to coordinate the style of your kitchen décor with the rest of the house and maintain an easy to use and clean material all the time. Tiles are very convenient for everyday mess that is created by sauces, hot liquids and hot oil etc. because they can be easily cleaned up with liquid cleaners. They also conduct the heat from hot vessels and thus are safe to use. Apart from that they enhance the look of a kitchen when arranged suitably. 1. Whether it is backsplash area or countertop, choose bright colors like red, blue, magenta etc. as any food stains will not show easily on them (just in case you don’t get time to clean the area regularly). White tiles for these areas are more prone to food stains and water marks. Choose it only if you can keep it sparkling clean everyday. 2. If you are installing the tiles on walls yourself, be sure to get the right measurements for the area being covered. Once you have measured and marked it well, ensure the tiles are cut well to fit to the area marked. Space between the tiles should also be considered well so as to keep the grouting easy and clean. Tile adhesives are available which can be used to fix tiles firmly on areas like backsplash etc. In case you think you cannot do it yourself, get a professional to do the job. 3. Keep your tools handy while arranging the tiles to avoid messing up the walls. You can check with the local hardware shop for adhesives, tools and grout as per your requirements. 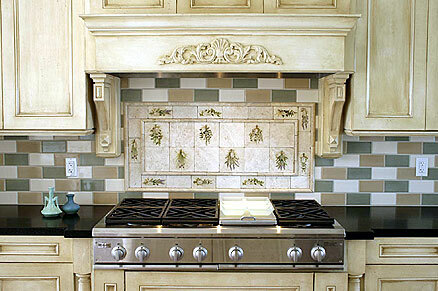 Kitchen tile designs come in materials like ceramic, granite, porcelain, glass etc. Check with the local hardware shop for durability as per the area being designed. For example if it is the countertop area, you may want to go with ceramic tile that can take high temperatures of cooking vessels with ease. You may also wish to choose from a variety of styles like mural backsplash, stone backsplash, glass or metal backsplash etc. Go for something that suits your style, is easy to maintain and fits in your budget. Kitchen tile design for floors is yet another interesting creative area of your kitchen. Though it is always better to go for simpler tiles in single shades, you may want to opt for some patterns like bars, checks or jig jag designs. Or use small tiles with big tiles to create a unique pattern. Diamond shaped arrangement also creates a visually appealing floor pattern. You can blend it with the flooring of your home or just come up with a brand new design. Again one should remember that kitchen tiles are prone to stains, hot liquid spills and grime generated from heat and smoke in the kitchen. Hence durability and ease of cleaning should be given preference when selecting kitchen tile designs for floor. Again, as is the case with wall tiles, you need to be ready with tools required for installation of tiles on floor. Choose adhesive for floor tiles suitably as it would go a long way in keeping the tile arrangement long-lasting and durable. Select the grout material that you want to use. Online layout designing is easy and can be found at most tile sites. You can first develop an estimate of the area to be covered; number of tiles required etc. by using such online tools and visualize how your layout will look like. If you are unable to use online tools, you can get help from your local hardware shop to help you plan the layout. Though tile arrangement is not an impossible task, but surely is one that cannot be changed very frequently. Hence do consider durability factor while making your selection. With just a few careful steps, you can easily sketch a whole new look for your kitchen. WOW!! Nice design of kitchen tiles. I often visit your blog because of the useful information you publish on it. Thanks. Great job! Thanks for sharing this. Kitchen is a place for moms like us; it is nice to design it with passion and with personality. I will use the tips you gave, thanks. What a handsome kitchen backsplash. I would have a hard time watching what I was cooking. Nicely done and thank you for the idea.